Chad Brown sends out a trio of runners in this race, two of which figure to go off as the first and second choices in the wagering. Camelot Kitten (#1) always shows up. Since returning to the races as a three-year-old, he’s finished in the exacta in five of six starts, only failing to hit the board when losing the Belmont Derby by just over a length—and that may have been one of his best performances. Irad Ortiz rides this horse well, and he’s drawn an advantageous post towards the inside in a race that breaks close to the clubhouse turn. There’s nothing too clever to say about him, but he’s nevertheless a major player in this race. Last time out, Camelot Kitten was run down in the late stages by today’s rival Inspector Lynley (#5). This horse had developed a habit of picking up minor awards in his races, but was able to take advantage of a fantastic ride by Joel Rosario last time to finally break through and earn a stakes win. In a field of horses that are so evenly matched, he’s far from out of the mix, and he may go off at a decent price once again. Chad Brown also sends out Beach Patrol (#10), winner of the Grade 1 Secretariat last time out. This horse ran exceptionally well two back in the Belmont Derby when he worked out a nightmare of a trip, going four-wide around both turns. He still finished well enough to beat his stablemate Camelot Kitten, who had gotten a much more favorable trip. He figures to appreciate the slight cutback in distance to nine furlongs, but he’s in a difficult position having drawn the outside post position. Florent Geroux is going to have to use him out of the gate to get into position early. I actually prefer a horse that finished behind Beach Patrol in that Secretariat. AMERICAN PATRIOT (#3) did not get a very good ride on that occasion. For whatever reason, William Buick was incredibly impatient and sent this horse through to make a middle move along the rail leaving the backstretch. He ended up getting stuck in behind a wall of horses and had flattened out by the time he got clear late. It was much the same story last time in the Commonwealth Derby, when Trevor McCarthy spent too much time on the rail and sent American Patriot through a tight spot in the final eighth of a mile. Today, I’m hoping that Mike Smith can maneuver him outside of runners. When this horse gets a decent trip, he can unleash quite a stretch run, as he showed in his allowance win in June and in his track-record-setting win in the Kent. 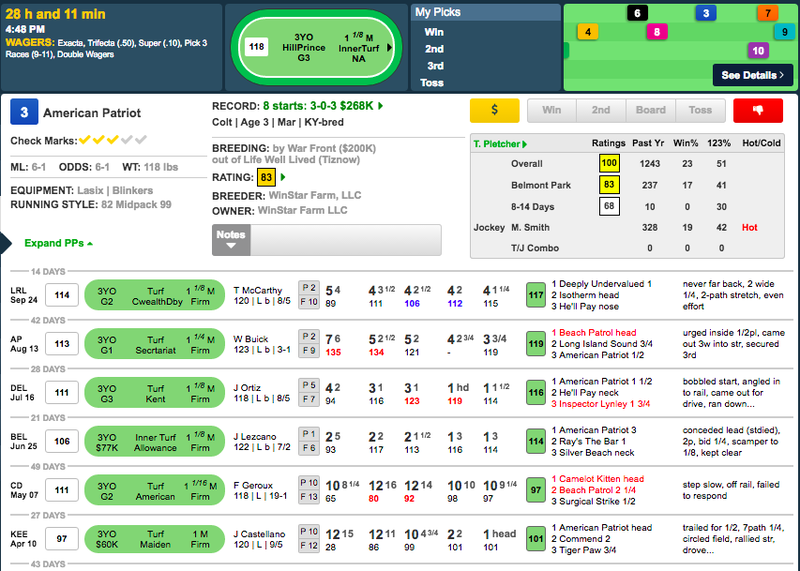 The horse that I’m perhaps most interested is Chad Brown’s least-heralded entrant, ANNALS OF TIME (#6). Chad Brown could have been more patient with this horse, since he’s still eligible for a N1X allowance race, but the fact that he’s running in a graded stakes speaks to his trainer’s opinion of him. This horse hinted that he might be pretty special in his debut last fall when he ran down Inspector Lynley, who has obviously proven to be of this quality in subsequent starts. He finally made it back to the races in early September at Saratoga and put in an effort that is much stronger than it might appear at first glance. He was never able to get to the rail at a time when you wanted to save ground on the Saratoga turf course, and was forced to make a four-wide run into the stretch. The race was dominated by a runner that set the pace along the hedge, and Annals of Time did extremely well to nearly run him down. Don’t let his scant list of accomplishments fool you—this is a serious racehorse.